People have been asking, so here are some quick and dirty shots of our new shop layout. We are still not done. We have SO MUCH stuff, we have had problems trying to get it all into a place of it's own. 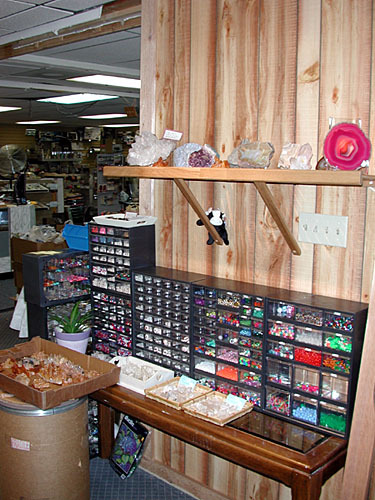 Our beads are still piled 2-3 trays deep, and 50-60% of our rock and mineral offerings is still packaged away!! Come by and help us out!! Take some of these wonderful things home with you! 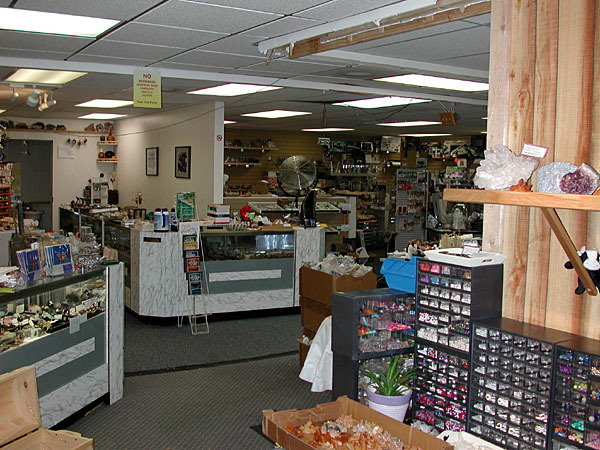 We have about 1500 sq ft of retail space open, with 7 display cases (31 feet long!) 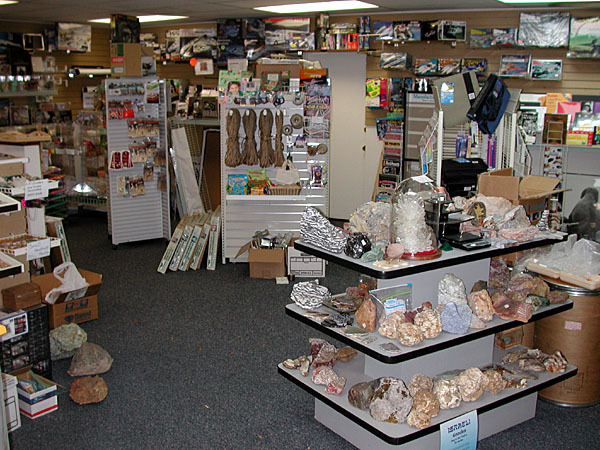 for rocks, glass/lampwork beads, and other delicates. 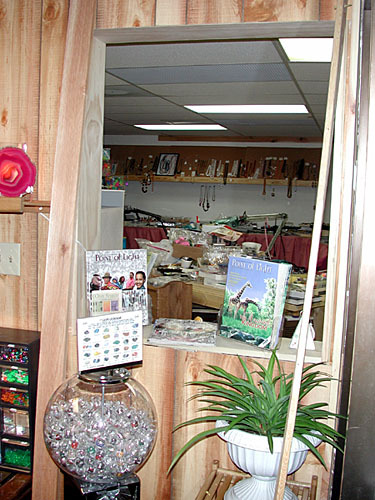 The new bead display area is about 500 sq feet total, with other beads and beading items scattered throughout the store! Two workstations, and up to 8 class seats will be available in the middle of it all! 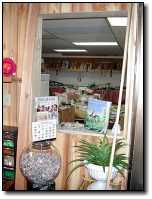 This is the main entry view, as you enter the shop. The hallway/walls are gone, and there is one big room past the entry baffle on the right. The rock pit is still on the left. That hasn't changed from the last photos much. Close up of the new wall. I just put the shelves up yesterday (11/17/02), and now you get a treat as you walk in the shop. 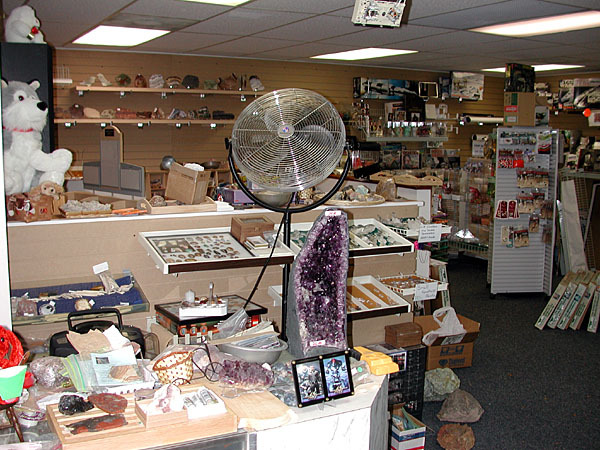 The plastic/ceramic beads will be moved to the back, and a rock/plant display will fill in under the shelves, most likely -- perhaps with an aquarium. This is a view into the back. The rough rocks and slab displayes on the left, and back wall, and the book/reference area to the middle. To the right in the back we have the pony/plastic beads for now, but will soon have it all celebrity/movie/ephemera along with the Sci-Fi model kits. This area is the "back" (or actually middle) of the store. (There is as much potential retail space behind that wall, as we have opened up! To the right will be the paper crafts, origami, quilling, and the start of the macreme/hemp areas, as well as potentially rubber stamps. The left is as described in the previous image. 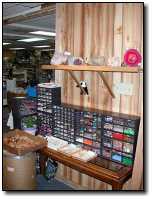 This is our new bead area! The shelves have layed out jewelry we made, acquired, or accepeted on consignment. 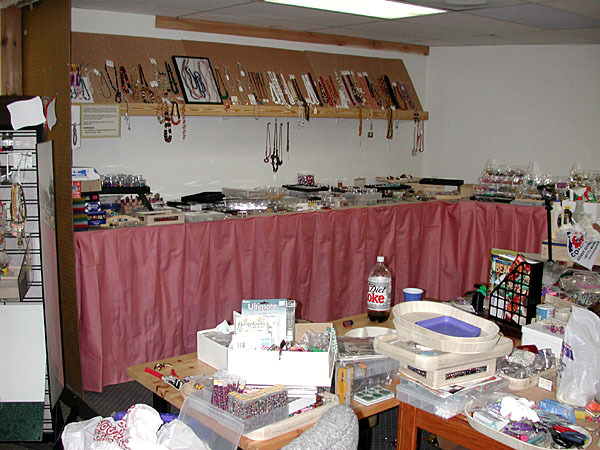 The tables have trays, bins, racks, and other stuff full of beads! We will hopefully have some acrylic risers for standard shapes, but many of the beads have to be looked at closely, so the only way is to keep them in individual cups and tins. 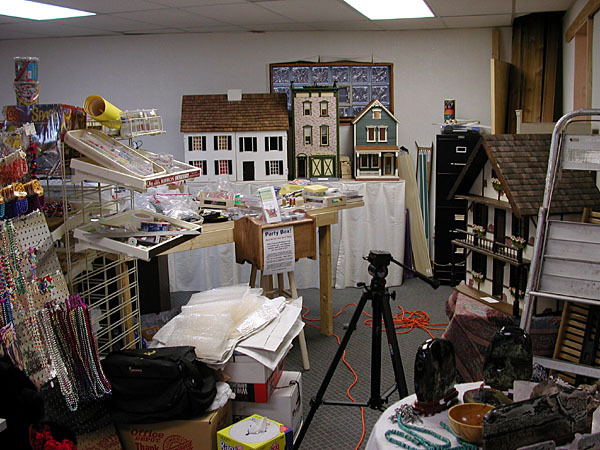 You can seen Marie's areas in the fore ground, for jewelry repair, her own work, and soon -- CLASSES!! There is another 12-18 feet of bead display tables extending to the right, and there will be similar shelves and display above that soon. This area is the edge of the beading area. The table behind the upright is the new-beads sorting/packing area (might as well let people see what is going on the shelves ASAP!) and to the right, along that wall, will be the dollhouses. The back right corner where the file cabinate and wood are will be the construction/dollhouse hospital area. The trim should all be up this week! !